Dan Duryea (1907-1968) made a vivid impression on moviegoers with his first major screen appearance as the conniving Leo Hubbard in 1941's classic melodrama The Little Foxes. His subsequent film and television career would span from 1941 until his death. Duryea remains best known for the nasty, scheming villains he portrayed in such noir masterpieces as Scarlet Street, Criss Cross, and The Woman in the Window. In each of these, he wielded a blend of menace, sleaze, confidence, and surface charm. This winning combination led him to stardom and garnered him the adoration of female fans, even though Duryea's onscreen brutality so often targeted female characters. Yet this biography's close examination of Duryea's oeuvre finds him excelling in various roles in many genres--war films, westerns, crime dramas, and even the occasional comedy. 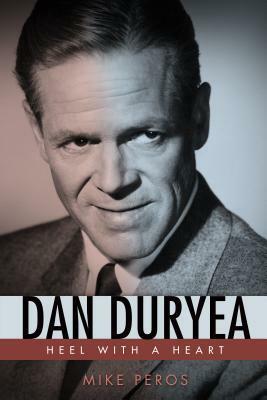 Dan Duryea: Heel with a Heart is a full-scale, comprehensive biography that examines the tension between Duryea's villainous screen image and his Samaritan personal life. At home, he proved to be one of Hollywood's most honorable and decent men. Duryea remained married to the former Helen Bryan from 1931 until her death in 1967. A dedicated family man, he and Helen took an active role in raising their children and in the community. In his career, Duryea knew villainous roles were what the public wanted--there would be a public backlash if fans read an article depicting what a decent guy he was. Frustrated that he couldn't completely shake his screen image and public persona, he wrestled with this restriction throughout his career. Producers and the public did not care to follow any new directions he hoped to pursue. This book, written with Duryea's surviving son Richard's cooperation, fully explores the life and legacy of a Hollywood icon ready for rediscovery.